Short weeks are seriously the best. Although it was busy and I definitely did not get enough sleep, it was overall packed with so much fun! This weekend will be a busy one as I'm doing IU's Glow Run tonight, going to the first tailgate and football game of the season Saturday and then have to study all day Sunday for a psychology exam on Monday. Let's hope it doesn't actually rain all weekend like the weather channel is predicting! People say it takes a while for your dorm to feel like home, but I think it really is starting to finally feel that way to me. I can't wait to curl up in my little corner after a long day and I'm so picky about keeping it perfectly clean. (I literally make my bed every day #noshame). Look out for a post all about my bed coming in the next few weeks! Caroline (hi roomie!) and I have been trying out tons of different workout classes and are loving the variety of options for exercise. 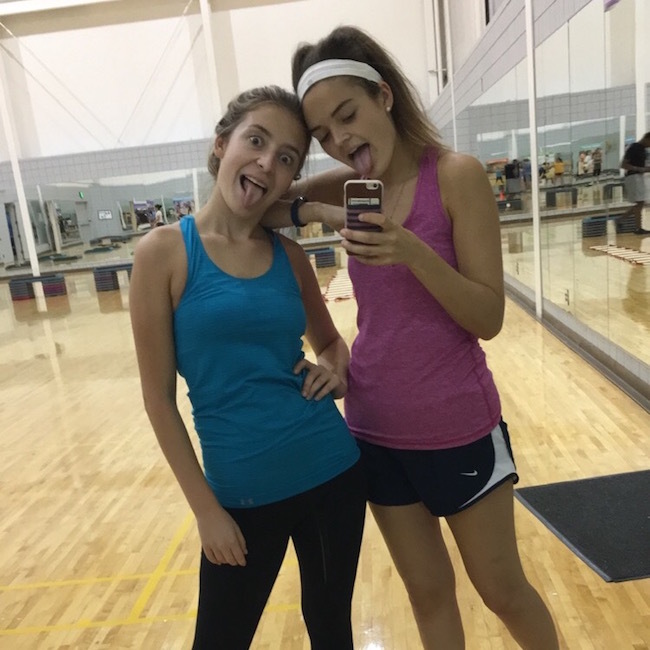 When we aren't feeling motivated to go run or hop on the elliptical (which is most days, let's be real), we go to a class instead and end up getting such a great workout. We also joined a workout club called CHAARG and are so excited to go to all of the small and large group activities! Our first care package arrived on Wednesday (after a long night of homework for our computers in business class) and we were so excited for some homemade cookies to arrive. You never realize how much you appreciate home cooked treats until you've been eating dining hall food for four weeks straight! It was a literal monsoon in Bloomington last night and although I looked like an idiot trudging around in my rain boots all night, it paid off when it actually started pouring! I guess it rains a lot here so I'm going to have to get used to walking to class in this weather (and covering up my backpack with my umbrella because I do not want my Emily Ley planner getting wet haha). Looks like college is going great for you! Happy Friday, hope you have a fun weekend! Looks like you've been having a ton of fun! I make my bed everyday as well, haha! Your room is so cute! Glad you are loving college so far! My hunters saved me in college, I wish they weren't so clunky walking around campus.